Happily married since 1985, our six children were born between 1988 and 2002. Our two youngest children were planned, unassisted homebirths. UnassistedHomebirth.com was created in 1998 and neglected for many years in favor of full immersion in parenting, family and other priorities. We finally updated the website and we’re glad you found us! Your philosophy of birth. One’s view of birth is formed and based on what our culture has established as the norm. That is not necessarily a depiction of YOUR individual, thorough and deep consideration of pregnancy and birth. You’ve got ONE chance at this birth. Your birth matters. You will remember it for the rest of your life. Treat yourself to the resources offered on this website so that you don’t become someone who has a disappointing and regrettable birth experience. Bob grew up in Schenectady, NY and is the oldest of ten children. Lynn admits that this provided many organizational tips for raising a large family. He received his B.S. in Computer Science from Siena College and M.S. in Computer Science from SUNY New Paltz. After seven years as an Army Officer, he joined Northrop Grumman, retiring from there in 2014 and taking a job with a much smaller company, where he continues in the software engineering field. He is the author of Oracle Warehouse Builder 11gR2: Getting Started (2011). He maintains a website: www.bobgriesemer.com. 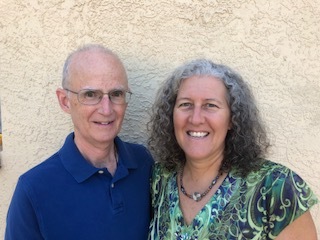 Bob has been an advocate of unassisted homebirth, along with Lynn, since 1996. He likes golf (but has a hard time making time for golf) and enjoys singing with the choir at his Church. Although his job is time consuming at this stage in life, he has always made time for family, camping adventures and many interests along the way. Lynn M. Griesemer is the author of “Unassisted Homebirth: An Act of Love” (1998), “Your Body, Your Birth: Secrets for a Satisfying and Successful Birth” (2007) (CD), and “Take Back Your Birth: Inspiration for Expectant Moms” (2018). She coordinated the First National Husband / Wife Homebirth Conference in 1998. Her passion for birth emerged from her birth experiences which included four hospital births and two unassisted homebirths. Lynn is dumbfounded that women are intelligent, yet flock in droves to someone else who gives them directives on how to give birth. A cultural hypnosis entices women into giving birth in the hospital, heavily medicated, with inductions and C-sections, leaving women disappointed and disillusioned. How many women unknowingly make choices that can be detrimental to themselves and their baby? Lynn and her husband homeschooled their children from 1994-2016 and enjoyed watching their children freely learn and explore the world around them in their predominantly unschooling lifestyle. Their five oldest children received Bachelors Degrees and are launching their careers. Lynn is a former Human Resources Manager and Army Officer. She received her B.A. in Psychology from Boston University and M.S. in Human Resources Management and Development from Chapman University. She received Toastmasters International’s highest award, Distinguished Toastmaster (DTM) in 2006. Lynn has volunteered at a crisis pregnancy center and a recreation center, and has served in leadership positions in various organizations. Lynn and Bob served as volunteers for the Conference for the Engaged Program with the Catholic Diocese of Arlington, VA where they gave presentations to over 1000 people between 2005-2007.